Botanical Name: Potentilla anserina, Argentina anserina. The genus name Potentilla derives from the Latin word “Potentia” which means power. The other genus name Argentina is drawn from the Latin word “argentum” meaning silver. The species’ scientific name anserina means “of the goose”, either because the plant was used as food for geese or because the leaves bear a resemblance to geese feet. Most Sandinativan common names of the plant include the word “goose”. 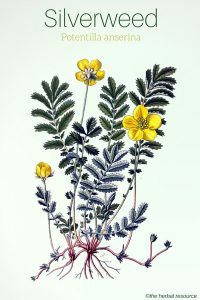 At first, the plant was placed in the genus Potentilla by Carl Linnaeus (1707 – 1778), a Swedish botanist, physician, and zoologist, but was reclassified in 1990 into the genus Argentina. This reclassification is still debated and not universally accepted. Other Common Names: Goosegrass, goosewort, wild tansy, trailing tansy, crampweed, moor grass, prince’s feathers, silver cinquefoil, argentina (Spanish), Gänsefingerkraut (German), potenille (French), gåsemure (Norwegian), gåsört (Swedish), tágarmura (Icelandic), ketohanhikki (Finnish), gåse-potenti (Danish). Habitat: Silverweed is native to the temperate regions of Europe, Asia, and North America. The plant is often found growing wild on river and seashores and in grassy habitats such as meadows, open woodland, and road-sides. The plant thrives best in semi-shade or full sun in well-drained moist soil and it tolerates maritime exposure. Description: Silverweed is a low-growing herbaceous perennial plant that belongs to the rose family (Rosaceae). It produces creeping stolons and evenly pinnate leaves that form 15 to 25 elongated leaflets. The leaves are covered with silky grayish or silvery hairs, mainly on the underside which explains the English common name of the plant “silverweed”. The yellow flowers are seated individually and appear from June to August. The fruit is a cluster of dry achenes. Silverweed is hermaphrodite (has both male and female organs on the same plant) and it is pollinated by bees, flies, and beetles. The plant is self-fertile. Plant Parts Used: The aerial part of the plant (mostly the leaves) and root are used medicinally. The leaves are collected shortly before flowering. The root is harvested preferably during late summer or early autumn. Both the roots and leaves should be spread out in a thin layer and dried in a shade at no more than 40 ºC for later use. Active Ingredients and Substances: Silverweed contains at least 2% tannins, flavonoid glycosides (including quercitrin and quercetin), coumarin, phytosterols, anthocyanins, choline, bitter substances, mucilages and resins. The plant also contains long and medium-chain polyprenols (isoprenoid alcohols) present in the leaves. These polyprenols seem to have anti-viral properties and ongoing research is being conducted to verify the effectiveness of these compounds in that regard. Silverweed is primarily used for its astringent effect due to its content of tannins. The root normally contains more tannins than the aerial parts. Because silverweed contains a much lesser amount of tannins than tormentil, it has milder but weaker effect on the gastrointestinal tract. Silverweed has been used traditionally as an herbal remedy for cramps and spasms. In folk medicine, it has been used as a relief for abdominal pressure, excessive internal gas formation, menstrual cramps, gastritis, stomach ulcers, fevers and intestinal and muscle cramps. The plant’s alleged antispasmodic effect on the uterus and intestines has been verified in research using animal models but later studies have not been able to confirm that this effect also applies to humans. Silverweed is not used much internally as an antispasmodic in today’s herbal medicine but it is often included in herbal mixtures and tea blends to treat diarrhea. Externally, the herb has been used as a mouthwash for inflammation of the mouth and throat, toothache, loose teeth, gingivitis, vaginal discharge and sore throat. In the past, distilled water from silverweed was used for cosmetic reasons to remove freckles and pimples and as a treatment for sunburns. 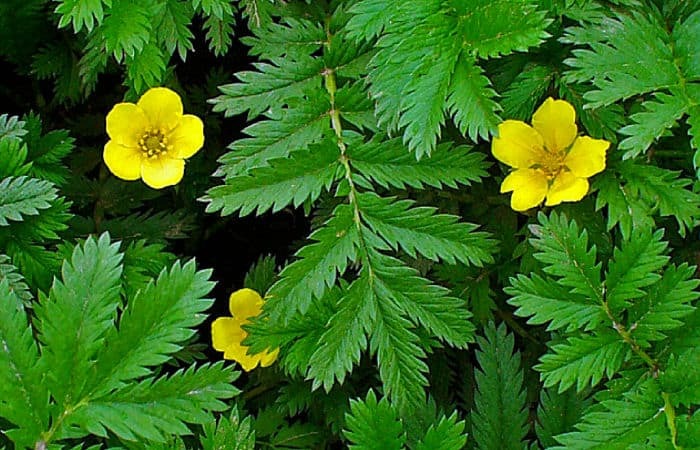 In addition, silverweed was used externally in the form of ointments and compresses as a remedy for bleeding hemorrhoids and to speed up the healing of wounds, scrapes, and cuts. The starchy rootstock can be roasted, cooked or eaten raw and it has a pleasant flavor, crunchy and nutty, similar to sweet potatoes, parsnip or chestnuts. In the past, the roots were used as food by the Native North Americans, the Inuits of Greenland and the Sami of northern Scandinavia. 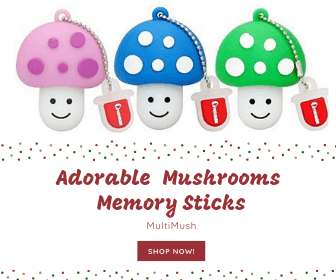 The roots can also be dried and ground to a powder that can later be mixed with regular flour and cereals, or used in soups. The roots have also been used as a coffee substitute. Young fresh shots or the leaves are edible and can be eaten raw or cooked. 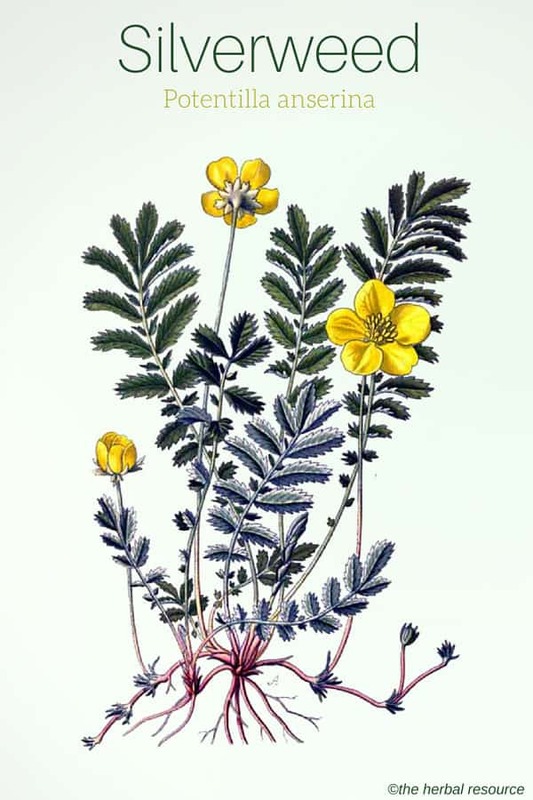 Silverweed was also used to dye yarn and tan leather. Silverweed can be used for therapeutic purposes in the form of herbal tea, tincture, ointment or compress. As tea: Add 2 teaspoons (2-4 g) of the dried herb to 1 cup (250 ml) of boiling water. Draw for 10 minutes and then strain. 2-3 cups of the tea can be drunk daily, preferably between meals. As a tincture: Silverweed tincture can be used in a dosage of 2 to 4 ml three times daily. As a compress: A compress can be made by soaking a cloth in a strong herbal tea. Add two tablespoons of the sliced dried silverweed in half a liter (one pint) of boiling water and allow it to steep for 20 minutes. When the mixture has cool down, soak the cloth or a cotton ball and apply directly on the affected area. No side effect or interactions with conventional medications or other medicinal herbs are known when silverweed is used properly and in moderation.